One of our favorite French toast recipes is based on one we received from a family friend in California. 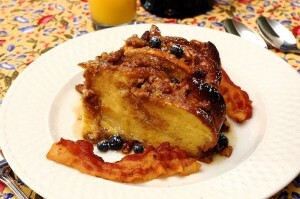 She sent us Paula Deen’s Baked French Toast Casserole with Maple Syrup. As some of our friends well know, we lived for a number of years in the Southern USA (Mississippi, North Carolina and Virginia), and love a lot of the Southern dishes. One thing we find, though, is that they are sometimes a bit rich for us. Consequently we’ve taken some of our favorites and altered them a little to be just a bit lighter (they are still very substantial – just ask our guests!). That’s what we did with this recipe. 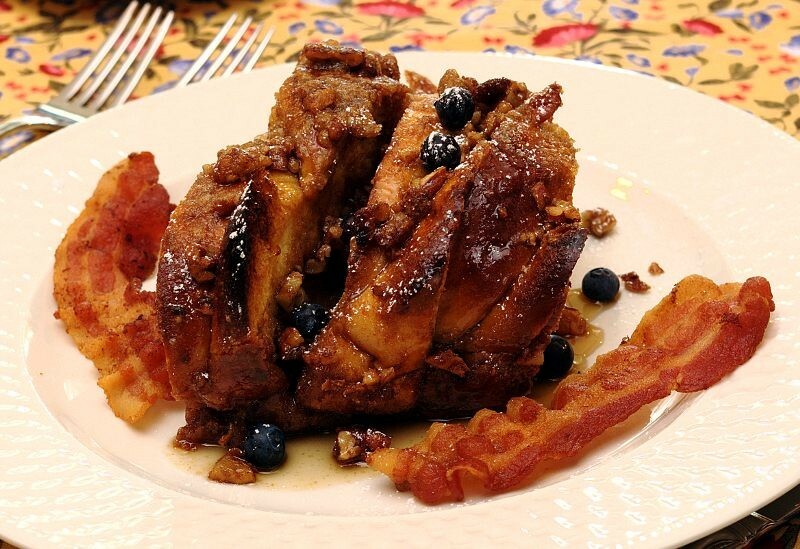 In fact, we had been serving our version as Brewster House Pecan Praline French Toast for some time before Ruth came across a video of Paula Deen making her French toast recipe. Based on the recipe we had from our friend, we had been laying the slices of bread down in the pan in layers, which made a great French toast in its own right. When Ruth saw the video, she realized that the way Paula Deen makes it, the slices stand up in the pan, wicking the custard up into themselves, and they look amazing! We tried it with our version, and wow! The taste was wonderful and the presentation was really impressive (as you can see from the photo!). Slice bread into 20 slices, 1-inch each. Arrange slices upright, in a generously buttered 9 x 13-inch flat baking dish in two rows, overlapping the slices. In a large bowl, combine the eggs, half-and-half, milk, vanilla, cinnamon and salt, and whisk until blended. Pour mixture over the bread slices, making sure all are covered evenly with the milk-egg mixture. Spoon some of the mixture in between the slices. Serve with maple syrup.Spread Praline Topping evenly over the bread and bake for 40 minutes, until puffed and lightly golden. This is such a great recipe!! Make it often. I need to plan ahead for a brunch and am wondering if I can freeze it and thaw the day before baking it. Have you ever done this? JULIE, SORRY FOR THE DEALY IN ANSWERING! BUSY SUMMER!! MARY HAS NOT TRIED FREEZING THIS, SO CANNOT TELL YOU IF THAT WILL WORK. GIVE IT A SHOT AND LET US KNOW IF IT WAS SUCCESSFUL! !